Fishing is one of the most rewarding sports there is, not only because it's a fun way to spend time with your family and friends, but also because you can eat what you catch at the end of the day! Whether you are fishing at the local lake or out on the open water, you're going to need specific pieces of equipment if you hope to catch fish. Basic fishing equipment you'll need includes a fishing rod, fishing line, and a fishing reel as well as fish hooks and bait. With these basic necessities, you've got pretty much everything you need to fish. As you become more proficient, you may want to invest in specialized fishing equipment like synthetic bait or stronger line. The line you use will depend on the size of the fish you are trying to catch. Heavier fish are more apt to snap thinner line. If you are a seasoned fisherman who goes fishing regularly, you're going to need new or replacement equipment from time to time. You might run out of hooks if you don't keep an adequate stock during a fishing trip. 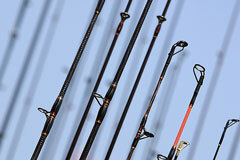 Your pole might be old and ready to retire, or you simply want to buy a new and better rod and reel set. Sports-Equipment.us lists online and local fishing equipment retailers, where you can browse and compare a broad selection of fishing tackle and accessories. Supplier of fishing, hunting, boating, camping, hiking and outdoor gear. Founded in 1972, Bass Pro Shops strives to offer outdoor recreational products which inspire people to love, enjoy, and conserve the great outdoors. Montana-based source of popular sporting goods and outdoor equipment. Bob Wards was founded in 1917 and features a series of branded concept shops online. Directory of fishing supplies and tackle makers and distributors in the United States of America. Each directory listing includes contact information, category tags, and a website link.